I’m big on support systems. I think that everyone needs to have their own support system in order to thrive. None of us can go it alone. A big part of my support system this year (since September) has been Tiffany Han’s Raise Your Hand and Say Yes Inner Circle program. It’s a creative business coaching/mastermind program with monthly content including courage challenges to push us when needed. This month’s courage challenge is to commit to 28 Days of Action. I’ve been feeling a little up in my head about a bunch of things lately. Between going away for a week, then coming home and being can’t get out of bed sick for a week, to desperately needing my post-new-year furniture rearranging time and new work ideas dancing around my brain; my head is just all over the place. I don’t have a specific place that I’m sitting/laying. I’ve tried laying in the back of my studio on the rug. That’s been pretty awesome, but it’s been extra cold the past couple of days, and my space heater doesn’t do much for the floor. So I’ve been sitting up on the couch or laying down with my knees up and a pillow under my head. Each day my action takes up about 10 minutes. I’m keeping track each day on the perpetual calendar in my studio. For the most part, I’m trying to work through my breathing, especially my exhaling. But sometimes, I just need to let my mind wander a bit, and in those cases, I just start choreographing ballet/modern dance moves in my head. I think Kanye has some of the greatest songs for ballet and modern dance. I chose these two songs, and in this order because of where I am in my own personal development right now. The first one, Power, is very much a deeply individual song. No One Man Should Have All That Power. 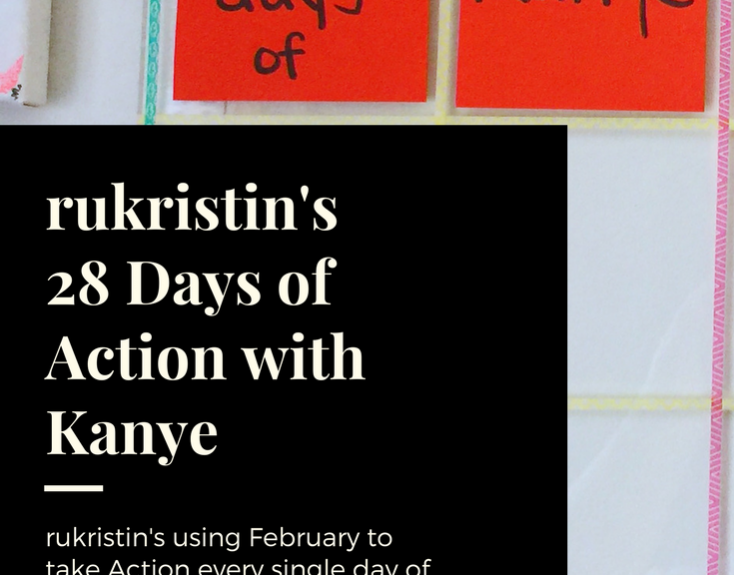 The words help guide me through the power I know I have, the power I know that I want, and the power I can achieve as me — rukristin: Feminist Scrapbooker; and what all of that means. It’s my hype song. The second one, Ultralight Beam, is about community building and believing in a higher power. There are a multitude of different voices in this song. I love that I can just picture the SNL performance as I hear it. I think that Chance the Rapper’s section in the middle is glorious. It gets me in the perfect headspace for community building. I feel so lucky to be able to bring people together to form a common goal. It’s the best feeling.